As I begin to choose my cards for the year and make my list there are a few names that go at the very top, with a note to get them in the mail as early as I can. The senior members of the British Royal Family are at the very top of my card mailing list and the note beside the grouping reads “Send on or before December 5”. 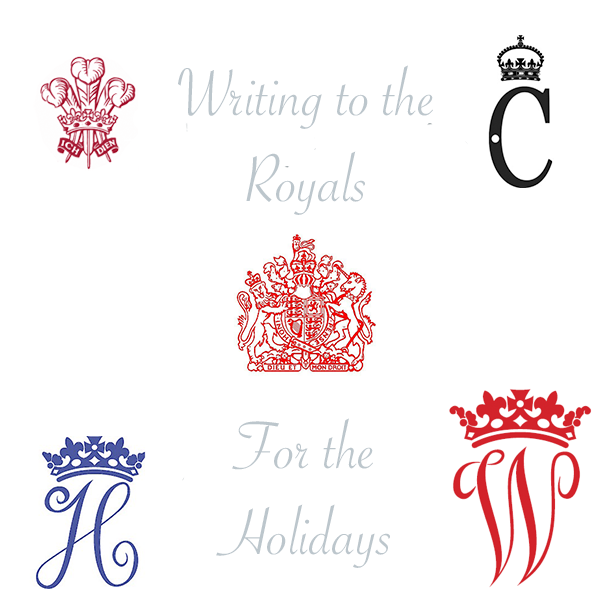 Last year I was home alone on Thanksgiving Day and so, while I waited for the family to arrive back home, I mailed out my cards to Buckingham Palace, Clarence House and Kensington Palace. Over the last couple of years I have written to and received replies from Her Majesty the Queen & His Royal Highness the Duke of Edinburgh, Their Royal Highnesses the Prince of Wales & the Duchess of Cornwall, Their Royal Highnesses the Duke and Duchess of Cambridge and His Royal Highness the Prince Henry of Wales. I try to find one card that I can feel comfortable sending to all of the senior royals. Some times that is the absolute hardest part. It is easy to be traditional, prim and proper with Her Majesty. It’s hard to fight the temptation to be be relaxed and playful with Harry. If you want to send a Christmas Card to one of the Royals I have listed above, here are the addresses that I have used since 2014. I have a 100% success rate in receiving responses. « All the Kate-Related Black Friday Sales — Ready, Set, Get Shopping!